Thank you for visiting our website. It has been our pleasure to serve the Ellicott City/Columbia community for many years. We serve great home-style Italian food, and have amazing New York style pizza. Our New York style pizza has been given rave reviews by locals, and we were given a 9.8 out of a 10 rating from City Search, "America's #1 online guide"! The atmosphere here is light, fun and all around relaxing. It is a great place to come for a date, a family night out or just for some delicious Italian food. We have a passion for making delicious Italian food, and if you have ever come by the restaurant, you know we also have a passion for soccer. 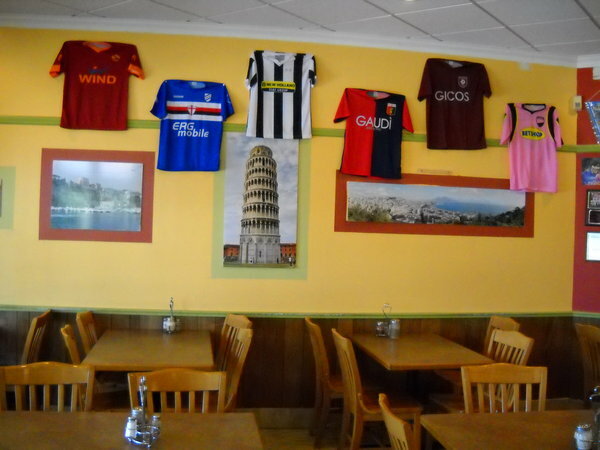 Soccer games play on the big screen almost all day long, and there are jerseys hanging around the restaurant of some of our favorite teams. As the owners, we make it our job to be involved in our restaurant, most of the time you can see us behind the counter, taking orders or chatting with the customers. We want you as customers to feel that you are getting great service and having a wonderful experience. Please feel free to come and talk to one of us if you have suggestions, or if there are any problems.